The Yo Yo Loach, sometimes called a scaleless fish, actually has small scales embedded in its skin. It's an active scavenger that is a semi-aggressive fish and lives well with its own species. This fish has several names, including the Pakistani Loach from its place of origin and the Reticulated Loach from its giraffe-like pattern. The name Yo Yo Loach, according to several sources, came from photographer Ken Childs, a major player in the aquarium import business for many years. There are two very different versions of why he dubbed this fish the "yo-yo." One version claims that the fish were so active that they were bouncing like yo-yos. The other relates to the fish's pattern which (especially in juveniles) looks very much like a collection of Y's and O's. The Yoyo Loach comes from slow moving and still freshwater rivers in India and Pakistan. It prefers to congregate in still pools with rocky substrates where there is plenty of aquatic vegetation and food. Loaches spawn upstream and then make their way downstream to live most of their lives. Yo Yo loaches from Pakistan are usually darker than those from India; it's not clear whether there is an environmental reason for this, or whether the L oaches are actually different species. The Yo Yo Loach is silver with dark markings that look very much like the letters Y and O. The letters are most clear when the L oach is young, giving way to a more solidly reticulated pattern as the fish matures. The colors can also appear bluish in certain light. When engaged in mock-fights or hiding, the Yo Yo Loach's markings can dim to gray, but they quickly return to normal. The mouth of the Yo Yo Loach points downward and sports four pair of barbels. When excited its coloration can fade out, and it is not unusual for it to play dead, much like its cousin the Clown Loach. The Yo Yo has great character and has been known to recognize its owner and become excited to see him. The Yo Yo Loach also makes a clicking sound when feeding on the surface. It does so by swallowing air and forcing it through the gills. If you keep a single Yo Yo Loach, there's a good chance it will team up with other fish in the tank. While this may not be a problem, it's best to keep a shoal of at least three, preferably more. Do not keep them with large or aggressive tankmates. Because Loaches can be very active and social, it's also best to avoid tankmates that are shy or slow moving. Other small catfish or small peaceful fish are suitable companions for Yo Yos. Groups of the same species. They can irritate shy delicate fish with their very active nature and should not be kept with slow-moving or shy fish. Can tolerate some aggressiveness from other fish. If kept as the only one of their species, they will "team up" with other fish in the tank. The Yo Yo Loach hails from still waters in India and Pakistan, and it prefers warm, soft, acidic water. Perform frequent water changes and keep the lighting subdued. It's very important the water be very clean and well oxygenated; your filtering system should be very efficient, and you should plan to replace tank water on a regular basis (30% per week is a good goal). Vacuum the substrate as well, being careful not to disturb the algae film that forms on rocks and gravel. When first introduced to the tank, Yo Yos are nervous and may hide. Be sure to provide it with ample hiding places, including spots where it can squeeze in and feel safe. Once acclimated, they will spend more time in the open. They are most active at night and enjoy burrowing into the substrate. If you think you are missing one, don't be supervised if you find it hiding in the gravel. Because Yo Yo Loaches can and do jump, it's a good idea to have a tight-fitting lid on your aquarium. 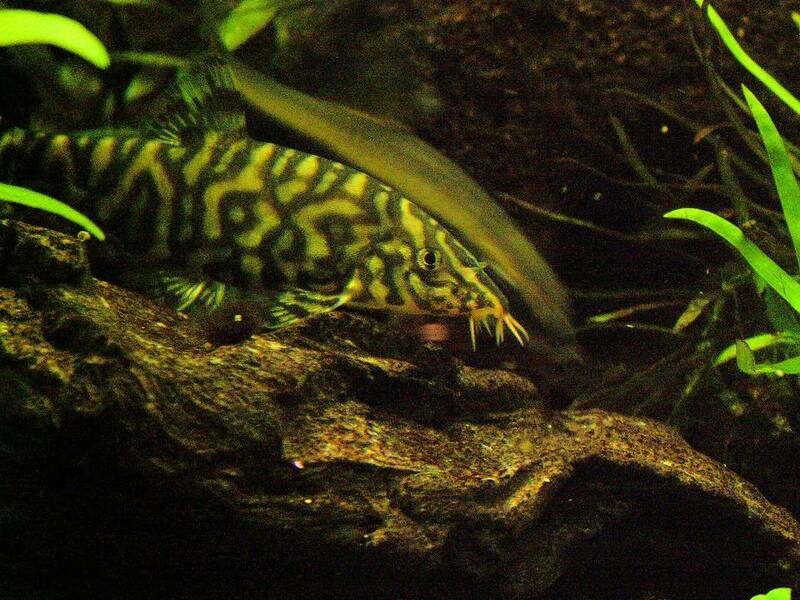 Loaches enjoy eating meaty foods, but are omnivorous and can eat vegetation if insects and other animals are scarce. Because they are versatile, Yo Yo Loaches are easy to feed. They'll eat almost anything they are offered, from flake to frozen to freeze-dried foods. A few sinking pellets fed just before turning the lights out will quickly be devoured. They are peculiarly fond of live foods and will gorge themselves on bloodworms and brine shrimp. They also will consume any snails they find in the tank, sucking them right out of their shells. To maintain good health, provide a variety of foods. Both sexes are similar, but males are generally more slender than the females who become noticeably fat when full of eggs. Males also may show a red color around the barbels. It is not unusual for mature females to fill with eggs, although they have not been bred in captivity. It is extremely unlikely that your Yo Yo Loaches will breed while living in your aquarium. If you're not wedded to the idea of adding a Loach to your aquarium and want to explore freshwater fish options, take a look at our large resource on freshwater pet fish breeds.